Carter goes high and the ABs win it back. Carter bangs it away downfield now. Now De La Fuente rolls it into touch just inside the 22. What a break into the Argentine half. But he's brought down and the counter-ruck sees Argentina win the penalty. That was the first sign of the Naholo we saw all season long at the Highlanders. Straight up the middle but such deception in his footwork and speed. Straight gas from Naholo. He got the ball and it looked like he couldn't decide if he was going to run or kick. But once he made his mind up he was off. Incredible acceleration. Bosch will have a shot from halfway. And it's out to the right. Carter goes high with the restart again and the ABs reclaim again. ANother good counter-ruck from the Pumas and another penalty for the Pumas. McCaw caught out on that one and Argentina will surely have a shot. The ABs have won virtually everything in the air tonight. Sanchez with the kick this time and it's over. 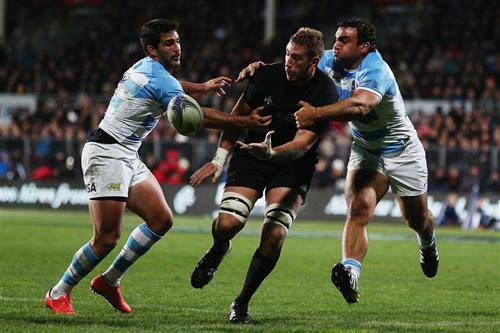 Carter with the restart and it's almost won back again but Argentina hang on this time. Argentina spill it forward and the ABs will have a scrum near halfway. I'm here in Vietnam, have stopped school and the other teachers are watching us play. Come on boys! There have been two main protagonists so far tonight, McCaw and Carter. They have scored all of NZ's points, Carter has been directing all the ABs play with his kicking and McCaw has given away a couple of penalties at the breakdown. Good scrum and the ABs spread it to the right. Great offload from SBW and Read down to the 22. Turned over but the ABs get the penalty. average half by the abs. but might be sowing the seeds for the 2nd half.too many errors. That all came from Williams' clever popped offload. He's been much better tonight than he was last week. Or he was in the second half of the season for the Chiefs, for that matter. Carter will kick for goal from the left sideline this time. And he curls it just away past the right post. Dear oh dear. Sanchez finds touch on the full from another restart. The ABs try to take it quickly by Joubert has whistled it back. The All Blacks will have the scrum on the 22, right in front of the sticks. Great attacking chance. And the All Blacks opt for another scrum. Why not? It's been very strong tonight.